Dekorra’s extensive line of artificial rock enclosures conceal the devices found in city, rural, residential, and commercial landscapes, including well and septic applications​. 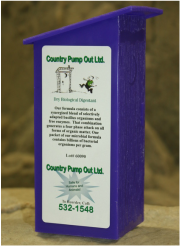 Country Pump Out is a distributor for Tanks-A-Lot, who is Western Canada’s leader in onsite water and sewage solutions. We offer a full line of quality concrete tanks to meet your needs. 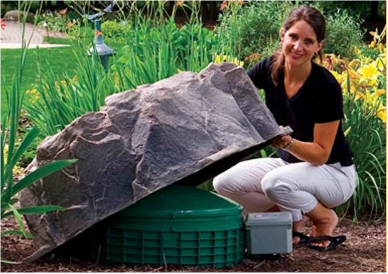 Durable septic system lid — one that will resist breakage from lawn-care equipment. 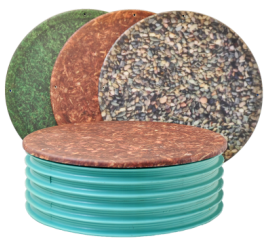 Available in 24 & 30-inch diameters, DuraFiber Lids have a non-skid surface with 3 landscape patterns — grass, river rock, & bark — which blend into their surroundings. Septic Klean III® Bio Bug enzymes to aid in the breakdown of solid waste in your tank. From the first application, Septic Klean III will restore the natural biological process in your septic tank and boost existing biological activity. ​Do you design, develop, manage, operate, or regulate a decentralized wastewater system? VeriComm® Monitoring System gives you efficient, remote monitoring and control for wastewater collection and treatment systems. ​Building on over 160 years of experience, Gould Pumps are among the most respected brands in the global pumping industry. All pumps and parts are manufactured to the strictest tolerances in an ISO certified facility.